Get Me to Fresh Prince of Bel-Air Night!! Featuring appearance by Alfonso Ribeiro aka ‘Carlton Banks’. 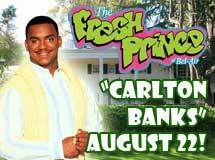 Meet & Greet opportunities and Alfonso will do the ‘Carlton Dance’ LIVE! The Baysox will hold a contest to have the opportunity to do the ‘Carlton Dance’ on the field with Alfonso during the game! Biggest reason we are going, there is no doubt in my mind that I am winning this contest and getting on the field to do “The Carlton” with Alfonso! I have been known to get down with The Carlton! I’ll tell you what, when I win this competition I will make sure I get the video of me gigging all over Alfonso Ribeiro at Prince George’s Stadium! ← Packers Training Camp Tradition is the Best in the Business!